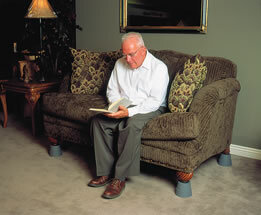 Furniture Risers make rising from or sitting on a couch, chair, or bed easier! Features includes, a heavy duty plastic reinforced with ribbed construction. 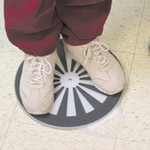 The non-skid pads protect floor finishes and furniture. The indentation with padded inserts on the top of the risers will accommodate standard furniture legs securely. Furniture Risers come 8 per package; four 3” risers and four 4” risers. The weight capacity is 350 lbs. which includes the person and the furniture. The product has a one year parts warranty and made in the <?xml:namespace prefix = st1 ns = "urn:schemas-microsoft-com:office:smarttags" />USA! 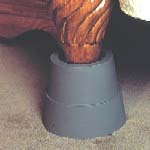 BedCane safely gives you a good solid grip when getting into and out of your bed without assistance. Use it on your home or hospital bed. It’s safe, , sturdy, stable, adjustable, and portable.